result that is larger than that. It is necessary condition to be STEEZ, it is super light weight ・ high sensitivity ・ trouble free. A unique rotary feel is realized by the synergistic effect of ZAION air rotor and oil specification ball bearing. Rotational performance also captures even minor changes in water, boasts of good responsiveness to react according to intention. Equipped with ATD, do not yield with absolute initiative. STEEZ created by the world's toughest Japanese field. 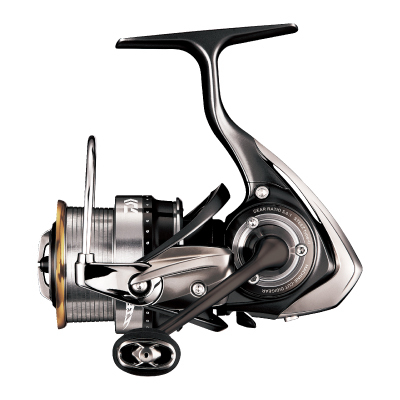 Shred off everything and sublimate (type # �U: 178 g) to the lightest spinning in the history of Daiwa (# 2500). Unexperienced pleasure always lies ahead of constant challenges. micro pitch shake. Handmade with high gear specifications and well capture the impregnable field. the long-throw ability is also high and the free fall performance is excellent. landing. It corresponds widely from land landing to boat with 5 lb - 80 m setting. .A new generation drag system that keeps on working while smoothly following the fish pull. a line break in advance. An air rotor with a structure to say also as a rotor revolution. By distributing the load with an optimal rim structure with a unique shape, it realizes substantial weight saving with the same strength as before. Rotor balance is also improved, resulting in good rotation of response. .It is a carbon resin woven with carbon fiber at high density, making it impossible to exceed magnesium by weight strength. It is adopted as the main part of the reel taking advantage of the ideal characteristic that it is high rigidity and light weight, and furthermore it is resistant to corrosion, unlike metals. Fluoro Type - Set to line capacity that Finesse can wind up 80 meters.